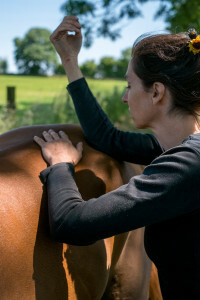 Home > Horse and Rider Shiatsu > Treating The Horse > What are the benefits? Shiatsu aims to assist the individual towards greater balance and natural alignment. As stress is released from muscles, tissues and structure of the body, mobility, comfort, attitude, training and performance can improve. Revitalize and support the horse after the strains of being ridden. Undetected, accumulated physical and emotional stress, if not dealt with can cause physical and behavioural issues which may impede performance.